13th century German great helm with a flat top to the skull. Great helms were worn with cloth and fiber padding on the inside, here shown removed from the helmet. The great helm ultimately evolved from the nasal helmet, which had been produced in a flat-topped variant with a square profile by about 1180. From this type of helmet an intermediate type, called an 'enclosed helmet' or 'primitive great helm', developed near the end of the 12th century. In this helmet the expansion of the nasal produced a full face-plate, pierced for sight and breathing. This helmet was largely superseded by the true great helm by c. 1240. A later variant with a more conical top is known as a 'sugarloaf helm'. In Spanish they are called yelmo de Zaragoza, referring to Zaragoza where they were introduced for the first time in the Iberian peninsula. 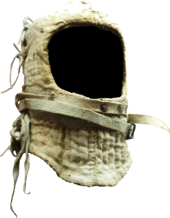 Although the great helm offered vastly superior protection than previous helmets, such as the nasal helm and spangenhelm, it limited the wearer's peripheral vision, and in addition to being heavy, the mass-produced form (flat-topped without ventilation holes) provided little ventilation and could quickly overheat in hot weather. Knights usually wore the great helm over a mail coif (hood) sometimes in conjunction with a close-fitting iron skull cap known as a cervelliere. 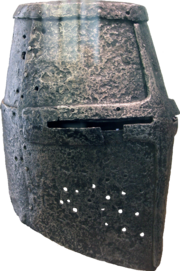 The later development of the cervelliere, the bascinet, was also worn beneath the great helm; men-at-arms would often remove the great helm after the first clash of lances, for greater vision and freedom of movement in melee combat. The bascinet had a mail curtain attached, a camail or aventail, which superseded the coif. Mail throat and neck defences such as these were made obsolete when plate gorgets were introduced, around 1400. The bascinet evolved from its early skull cap form to supersede the great helm for combat. The great helm fell into disuse during the 15th century; however it was used commonly in tournaments where a version of the great helm, the frog-mouthed tilting helm, evolved. Crests, such as crowns, feathers, caps of maintenance, wings, lions, etc. The great helm is today especially popular amongst live-action role players and in medieval re-enactment such as the Society for Creative Anachronism. It is inexpensive, easy to manufacture with even rudimentary equipment (metal scissors, drill, rudimentary anvil, rivets and hammer), and provides good protection for the head against both sharp and blunt weapons. Its biggest drawbacks are poor ventilation and air circulation, especially if worn with closed-cell foam padding, making it very hot in warm weather. Modern reenactment versions of great helms weigh 1.5 to 3 kg. For safety reasons, they are made from thicker steel than medieval originals but are not overly heavy, cumbersome, or uncomfortable. Although visor slits are usually only some 20–30 mm wide, they do not greatly restrict the field of vision as they are very close to the wearer's eyes. ^ Arnow, Chad. "The Great Helm". myArmoury.com. ^ Source Noticeboard in Stafford Castle on 1 October 2011 medieval armoury. Wikimedia Commons has media related to Great helm. "Surviving examples, and illustrations". Archived from the original on 1 April 2011.